My name is Joanne Hargate I am 36 years young and live with my husband Peter in Stannington. We have been together 14 years, and as part of our planning to start a family we married in 1997. Unfortunately, that was also the year ME struck and our plans were stopped. For 5 years and for each working day I had travelled to Doncaster to my post as primary teacher and during that time I rarely had a day off, even with flu. This was my mistake for it was one of the reasons I headed for ME. I was diagnosed in 1998 with ME at The Hallamshire Hospital, Infectious Diseases Department. However, by that time I was over the worst and was told that my own GP would therefore continue to monitor my health. But, I was not happy with the GP I had at this time. This was due to various reasons the main one being that he had continued to sign me off from teaching due to depression, even when I clearly was not depressed. As a positive move, I changed my GP to another who did correctly write down the right diagnosis. Achieving an early diagnosis, pacing and rest have been crucial in 'calming down' the ME. The ME ceased my monthly cycle completely for over a year. When my cycle did return it was minimal, I did not menstruate properly for 2 years. Consequently, only then could we resume family planning. However, you can never map out life that well for in October 2000 I was diagnosed with cervical cancer through a routine smear test. November 11th at 10am I underwent a Wertheim's Hysterectomy plus other necessary surgery including the removal of lymph nodes from my stomach and tops of both legs. Looking back I coped with the operation well. I put this down to the fact that I had already come to terms with grief and loss due to the ME. I felt that I had already been to the depths physically and mentally so I couldn't go down any further. Also, the operation saved my life and I had a renewed sense of the preciousness of it. If it had been my time to pass on I would have felt that I was leaving on a happier note. I did however grieve for the children me and Peter could not have together. Consequently our family plans took a different turn altogether, we were very soon offered IVF through surrogacy by the Hallamshire. I still had my ovaries which were healthy but myself and Peter had already discussed that adoption would be the way forward for us. We knew adoption would not be a short process and since we'd already been planning for years a few more wouldn't matter. We have had our problems with the process itself and various 'professionals'. Nevertheless, in the end, we were appointed to the right Social Worker and this now means that we have a wonderful daughter. 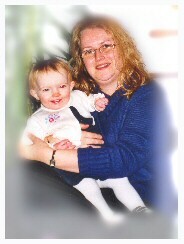 Hannah was placed with us September 15th 2003 aged 9 months, and she legally became ours January 14th 2004. She sleeps for 13 hours straight through the night and 1 hour sleep in the afternoon ( I realise this will not always be the case!). Because of the ME, Hannah was particularly chosen for these reasons as well as for her lovely temperament. Unfortunately because of the ME we had to say no to any severely demanding children. We count ourselves fortunate that we were able to 'choose' a child in this way to fit our needs, and, in the future if we decide to adopt another child to give Hannah a brother or sister to play with, we will be more prepared for the adoption process and people concerned. For the seven years that I have lived with ME I have had various physical ups and downs. This time last year I had much difficulty walking and could have used a walking stick. The previous relapse before that one meant I could not drive for a few weeks as my thinking shutdown. So far for a year now I seem to have reached a plateau or glass ceiling, with gentler waves ME wise, and no severe dip down. I hope to say the same this time next year. Thankfully, apart from at the initial severe stage of ME, I have not been greatly affected mentally, apart from the ME memory and concentration problems of course. My brain and body muddle along with the ME, and know to expect payback if I do too much. I have learnt not to try to return to work until I am sure my body can easily, with no repercussions, fulfil the responsibilities of a post's contract of employment. I try to pace activity and not fill in my diary too much. I don't always get this right so at times I need to refuse social activities and postpone chores. I do this with an easy conscience now. ME has made me listen to my body more and my mind is tries not to be as selfish as previous to the ME. This in turn, lets my body rest and recuperate when needed. I happily help out as a Trustee for the Sheffield ME Group. I have met some positive people here and am enjoying my voluntary committee work very much. Being a parent is a lovely person to be, but I would also like to give to others with ME some sort of support in whatever way I can. Apart from this, I also have the option, if needed, of two complete rest days. Helping people with ME is mainly why we have settled Hannah into a nursery for two days per week. I can either work from home or go into the office depending on what is needed. I remain cautious for the future, and will see how I am next year before I up the stakes energy spending wise. The best thing for me physically has been to stop paid work. The best thing mentally has been the support of family, colleagues at the ME Group, and friends. I realise not everybody has as much support as what I have had and so I count myself fortunate, and can only hope through groups such as ourselves that we can reach others with ME. To reach people with ME, specially in the early stage is vital in order for a better life with ME, even if you don't fully recover, life with ME can be liveable and enjoyable. I hope for healthier times for us all. Article written by Joanne L Hargate. Taken with permission from the Sheffield's ME Group Spring Newsletter 2004.